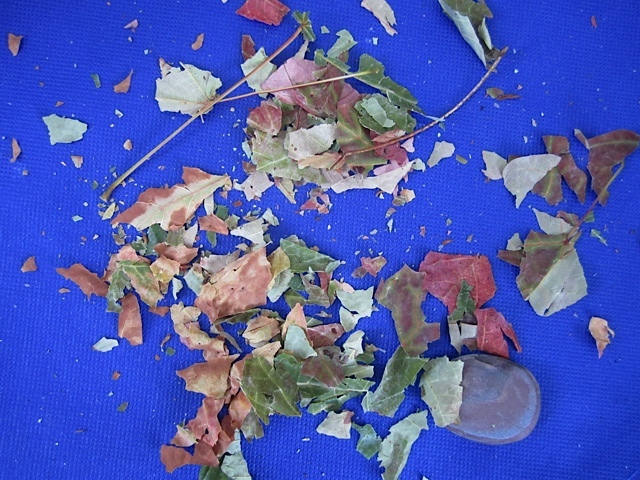 Fall is here, the leaves are starting to turn and the air is becoming crisper. Hooray! It’s time for the scents and smells of autumn. 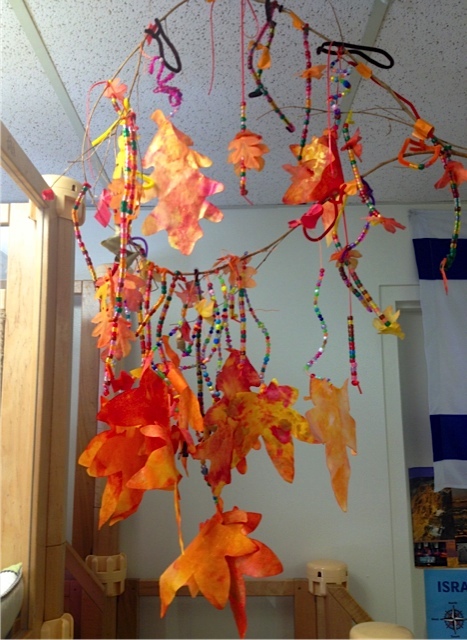 Here are some fun ways to bring autumn themes into YOUR home or classroom. 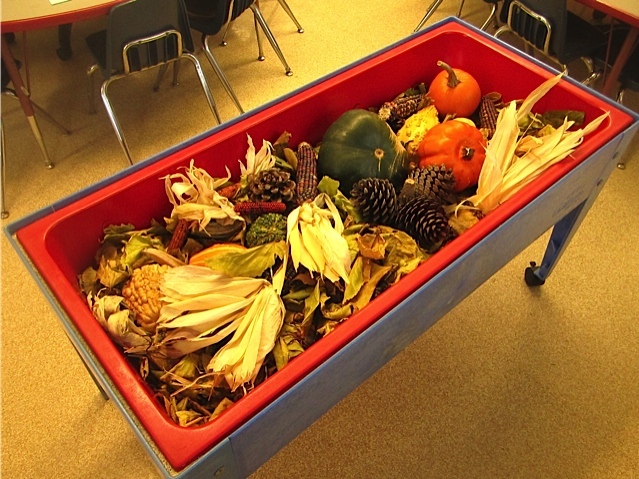 Small gourds and Indian corn make great additions to your sensory bin and inspire children to observe, compare and explore nature and its many attributes. 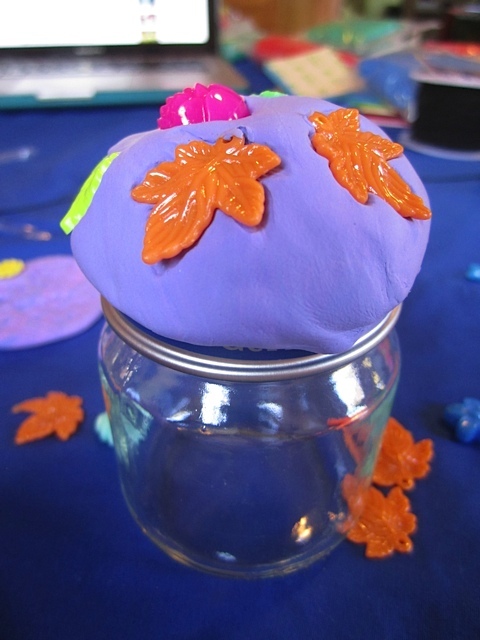 This sensory bin promotes STEM learning foundations, as does the observational painting that you can introduce with the same gourds. 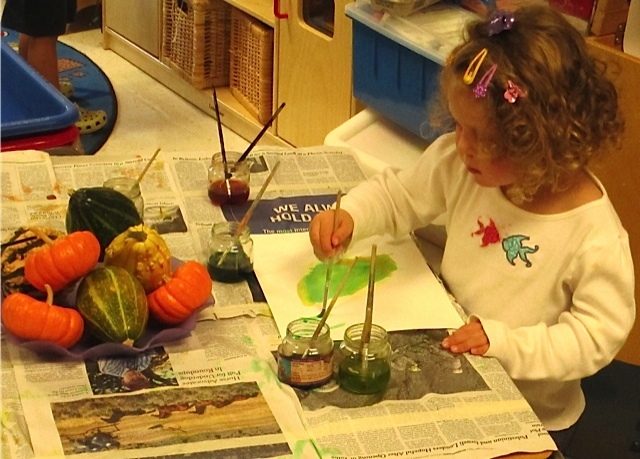 This 3-year-old is painting with Colorations® Liquid Watercolor™ as she observes and documents a gourd. 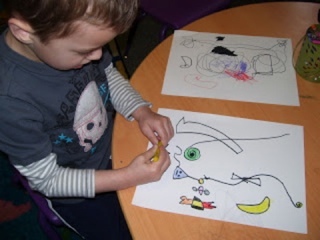 Observational drawing and painting is an important way to facilitate critical thinking and brain development in early childhood. 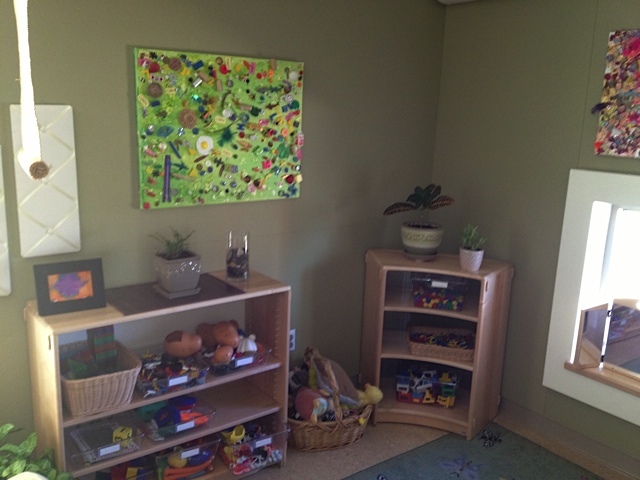 Drawing and painting from nature can also slow children down, reduce stress and promote self- regulation. 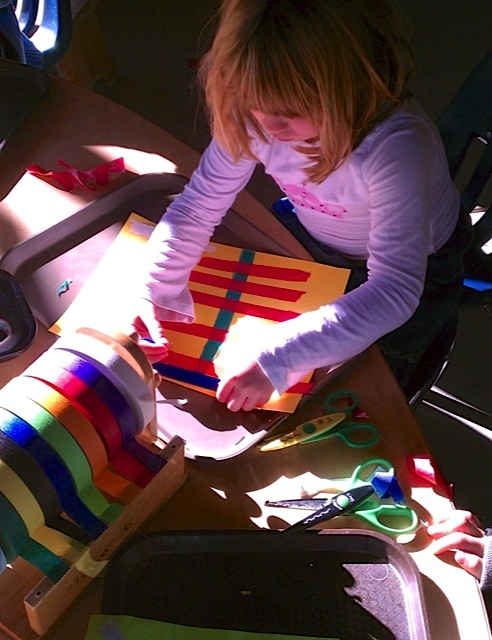 These are important skills for children to learn that go way beyond the more obvious benefits of art-making. 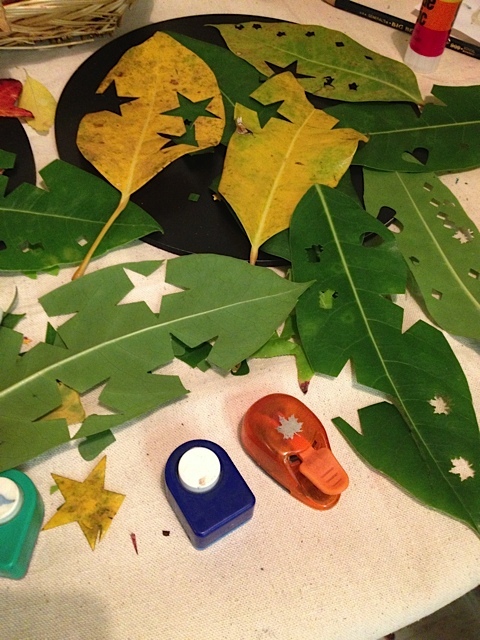 Leaf Punching is a great way to incorporate nature into your fall art activities. 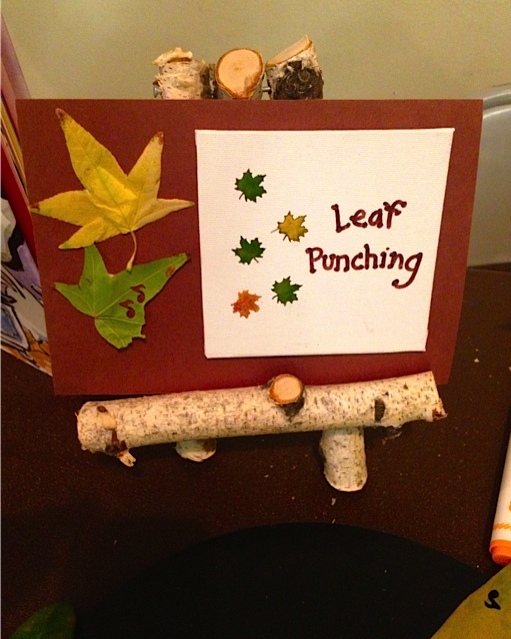 Use large hole punches that are easy for young hands to manipulate and punch shapes out of leaves that are at various stages of drying out. 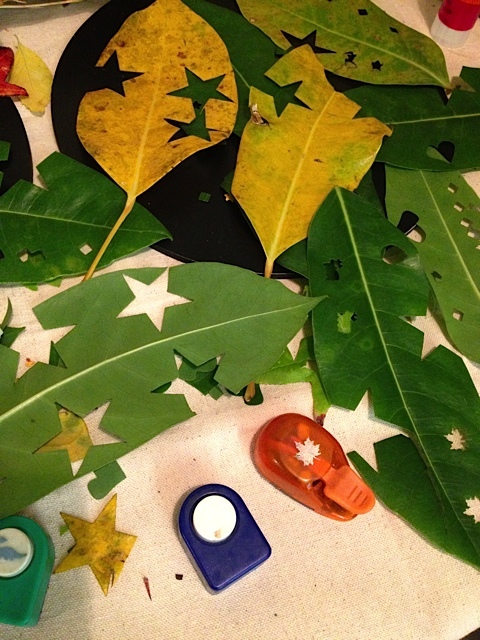 You can also let colored leaves dry out completely and crunch them into “leaf glitter” to use in collage work. Tree bark makes a good natural painting surface. Look for fallen bark pieces on a nature walk this time of year. 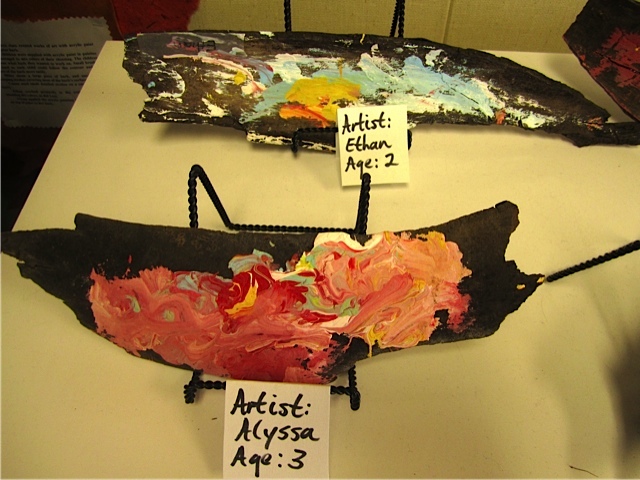 These chunks of eucalyptus bark made for wonderful paintings by 2- and 3-year-olds. 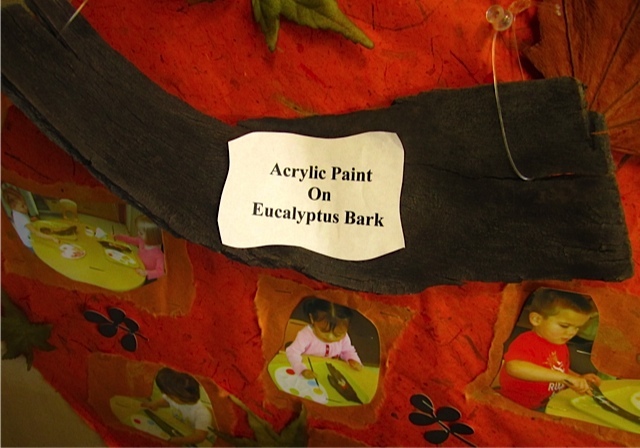 Painting on bark calls for an opaque paint, like acrylic paint. 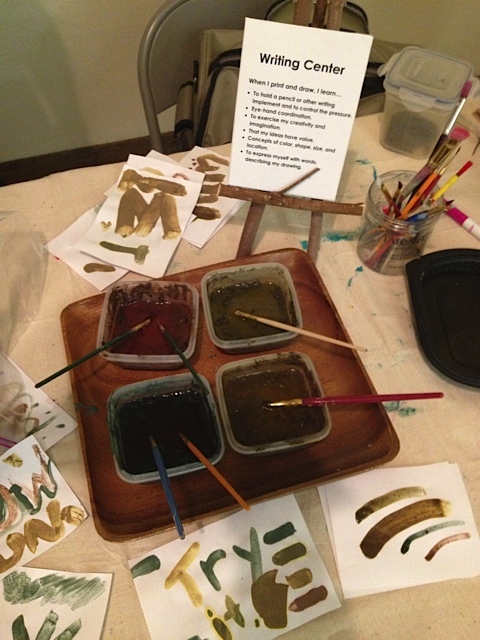 Don’t forget how much fun it can be to add Colorations® Liquid Watercolor™ to soil and paint with it. 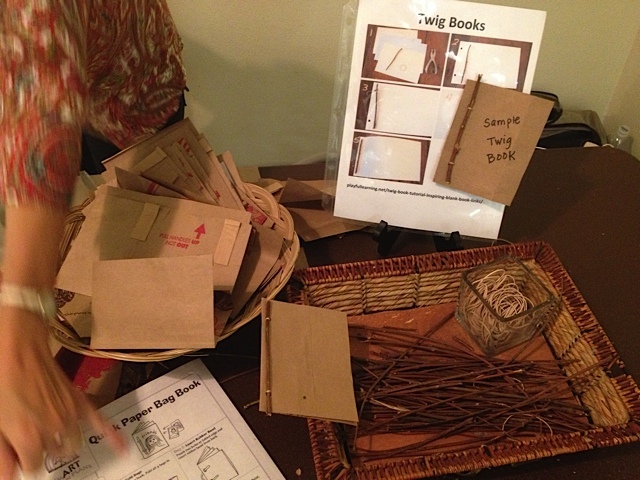 This Writing Center incorporates color-tinted soils to Twig Books, a variation of the Paper Bag Book lesson plan from Smart Art Ideas. Thanks for checking in and have a wonderful autumn. 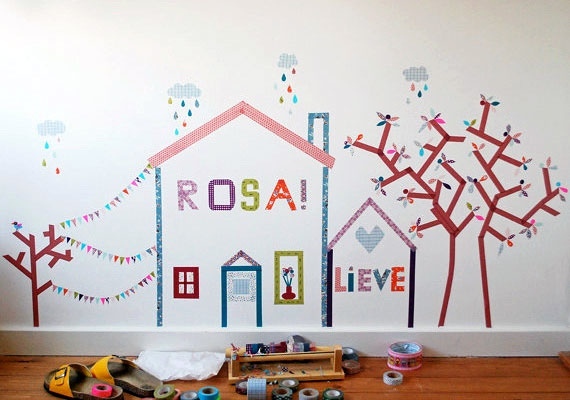 Exciting Colored Craft Tape – Catch the Trend! Colored craft tapes are exploding with bright colors, patterns and FUN this year, so it’s the perfect time to discover this newly expanded arts and crafts material. Catch onto this trend, and you’ll be amazed at some of the easy applications you’ll discover. 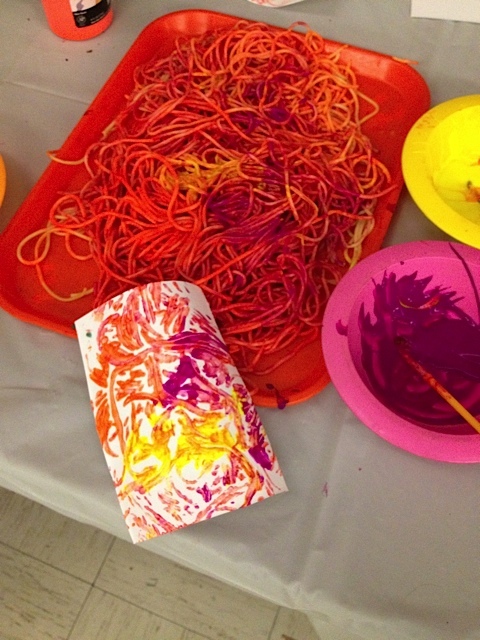 Check out these colored tape paintings from Pierce College’s Child Development Center, aren’t they beautiful? As simple paintings they would have looked good – but with the added texture of the craft tapes, they look GREAT and really capture your attention. 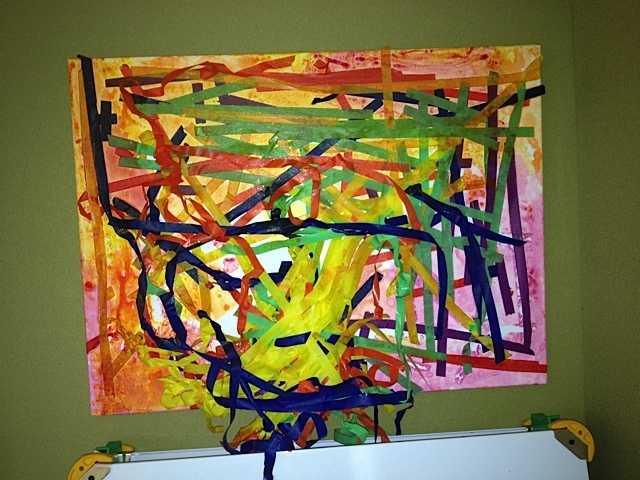 The addition of colored tape turns a painting into rich media artwork that looks like “gallery art,” but is easy enough for a preschool child to create. Amazing, huh? Thin craft tapes like these originated in Japan where they are called “Washi” tape. Washi comes from wa meaning Japanese and shi meaning paper. Here are close-ups of washi-style patterned tapes. 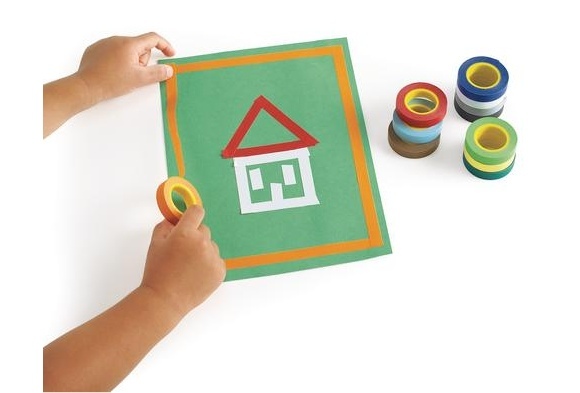 Both the bright solids colors and the patterned tapes are easy for young hands to tear and stick down on paper. 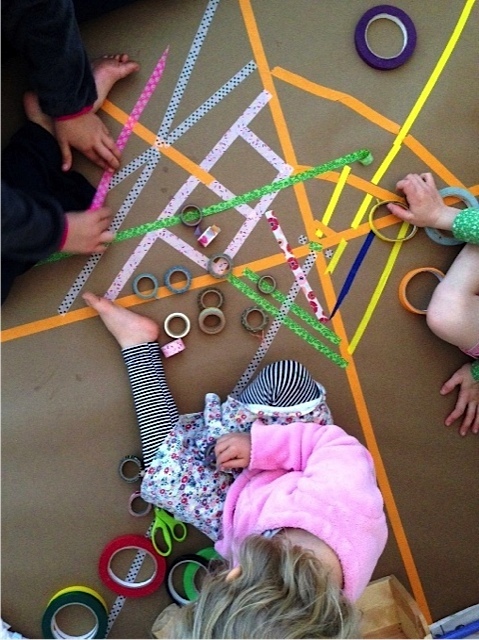 Children can design with both solids and patterns on a large piece of butcher paper, placed on the floor. 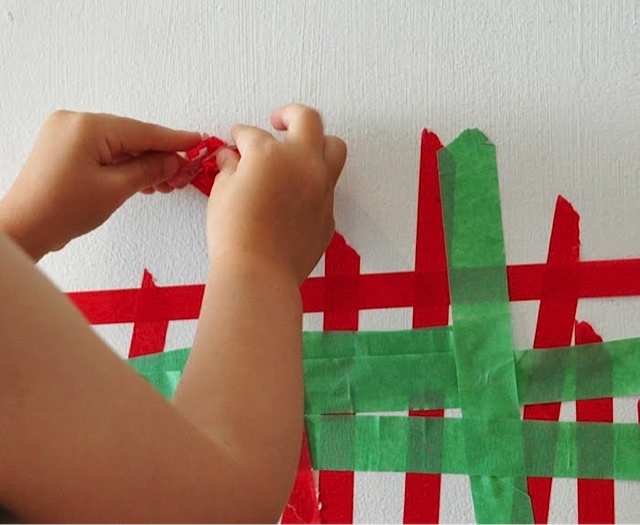 You can also apply tape directly onto the floor or wall since these are “low tack” tapes that do not harm surfaces, and are easy to remove. 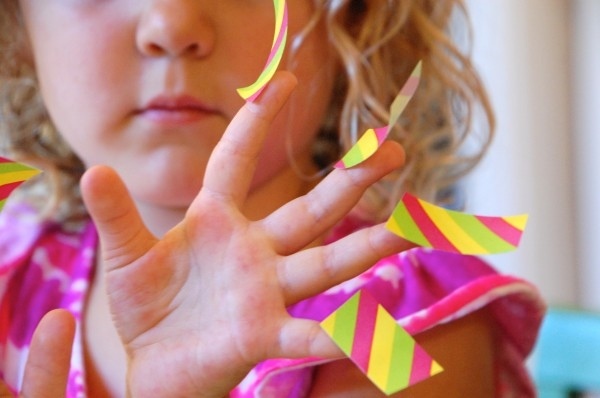 Grown ups will enjoy using craft tapes too! 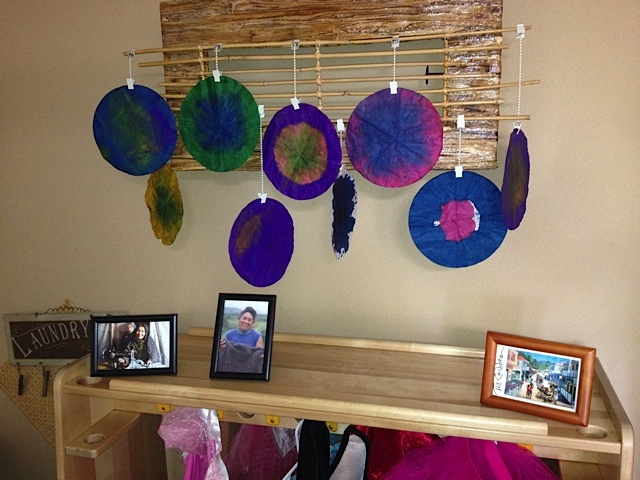 This child’s room wall shows one of the many ways parents and teachers can use colored tapes to create wall décor that is easy to change and adapt over time. 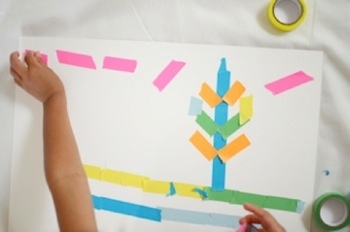 But best of all, you don’t have to be a grown up to make colored tape art – from simple to sublime applications. 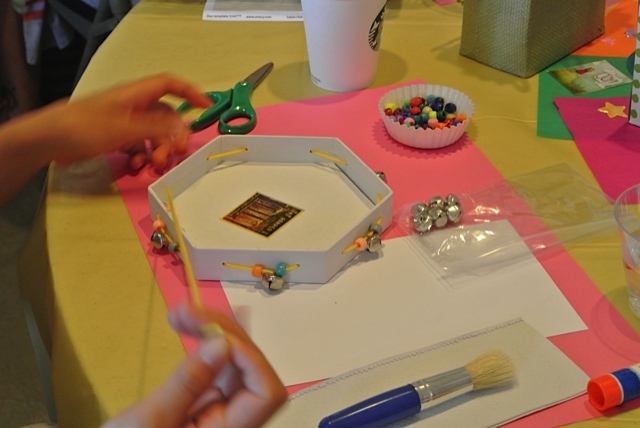 They are so bright and inspiring, people of all ages will want to dive in and discover their own creative ways to play. I’ve been including craft tapes in my conference workshops this year, and teachers quickly fall in love with them. 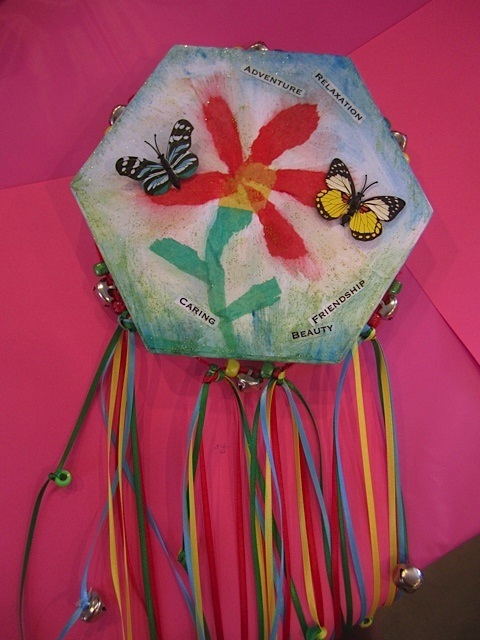 Recently we added them to paper mache tambourines and “secret books” to everyone’s delight. Here’s a great offer on beautifully colored and patterned craft tapes. Try some soon and see what YOU come up with! And check back next month for another special offer on my recommended arts & crafts products from Discount School Supply®! Receive 15% OFF the below products! Use code ANNAJULY at checkout. Offer valid on below products only. Offer expires 8/31/14. 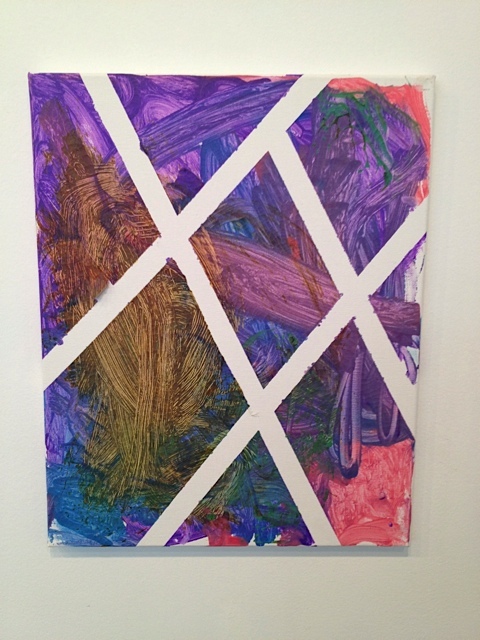 Line is one of the essential “Elements of Art,” and one of every child’s first art experiences. Line precedes all other elements of art. 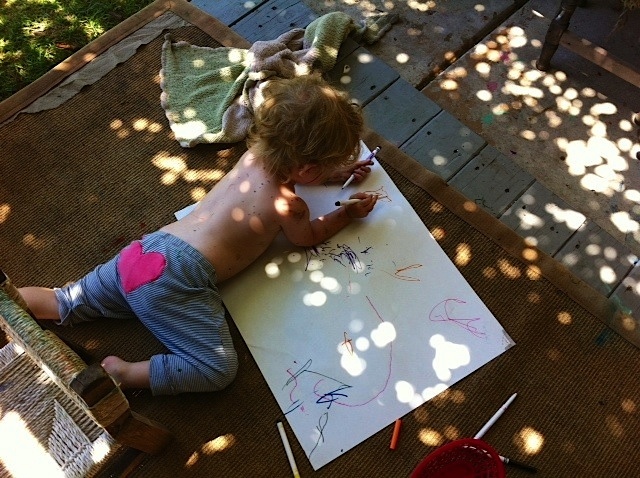 If art is a child’s first language, then line is where the child’s self expression begins. What does it mean to focus on LINE? It means breaking down the elements of art into their components, expressing those components individually, and then naming them so they become part of your verbal and visual vocabulary. 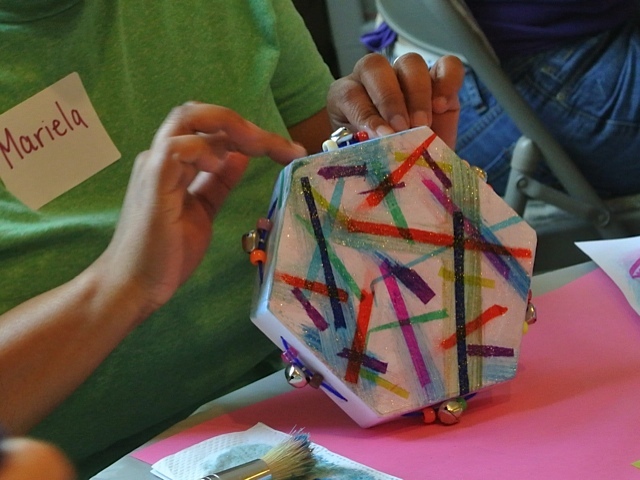 As we provide art experiences for children, we often forgot that breaking down the elements of art into line, shape and color – is a good way to begin. 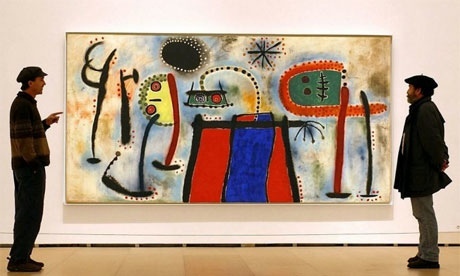 Teachers who like to inspire children with Paintings from the Masters often include the work of Miro, an artist who emphasized LINE in his work. But you don’t have to focus on the Masters to emphasize line in your art program. 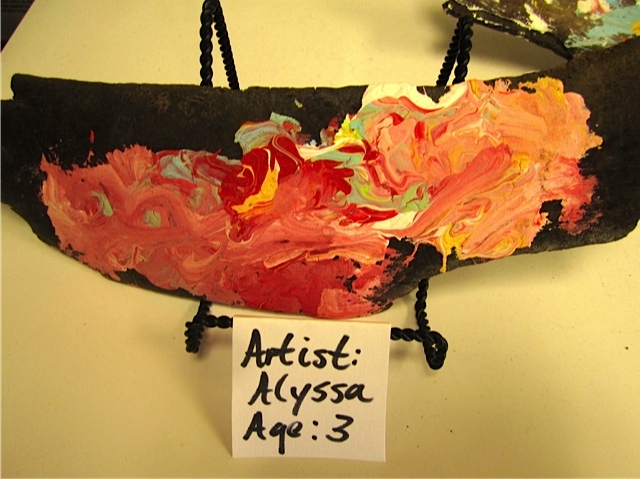 The Common Core Standards and Pre-K Foundations remind us that LINE and the other elements of art should be an important focus in early childhood education. 1.3 Identify the elements of art (line, color, shape/form, texture, value, space) in the environment and in works of art, emphasizing line, color, and shape/form. 1.1 Communicate about elements appearing in art (such as line, texture, or perspective), and describe how objects are positioned in the artwork. 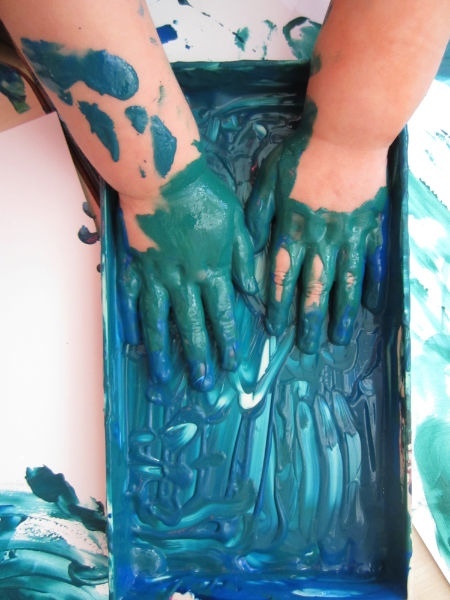 As you organize your art area and make decisions about what types of materials to provide, keep in mind that line can be explored not just with crayons and markers, but with other exciting materials as well. 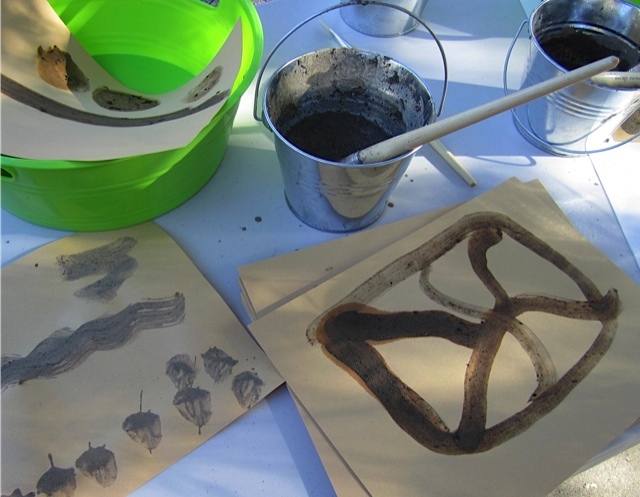 I love the idea of exploring line with mud painting, shown here from an Outdoor Classroom Conference in Pasadena. 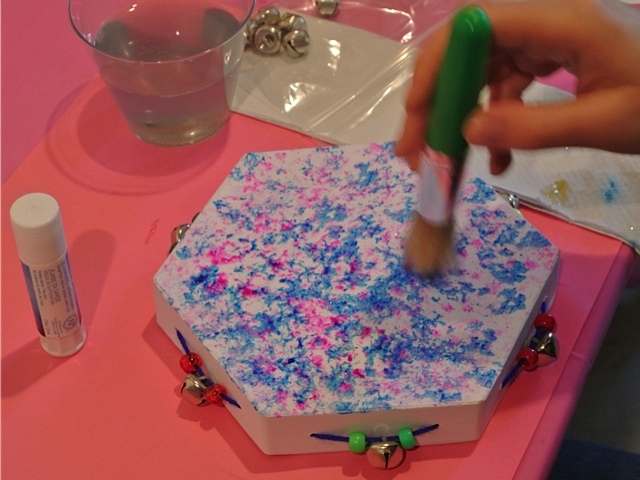 Here’s a video clip of Marble Magnet Painting, a fun science-oriented exploration of line art. 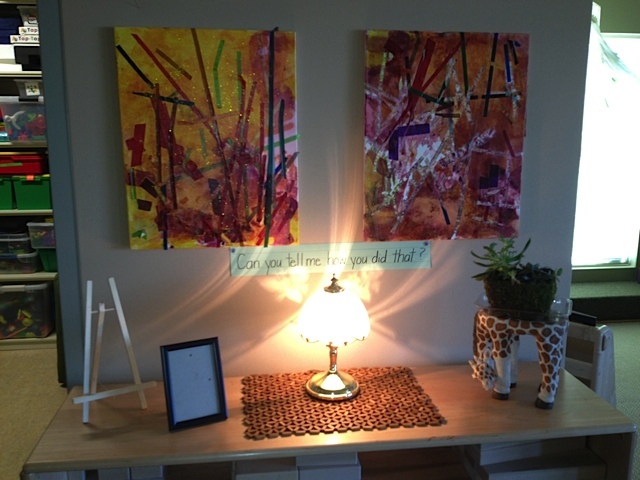 The second photo shows the same painting turned into a monoprint. The new colored tapes are easy for young fingers to tear and are perfect for exploring the quality of line. 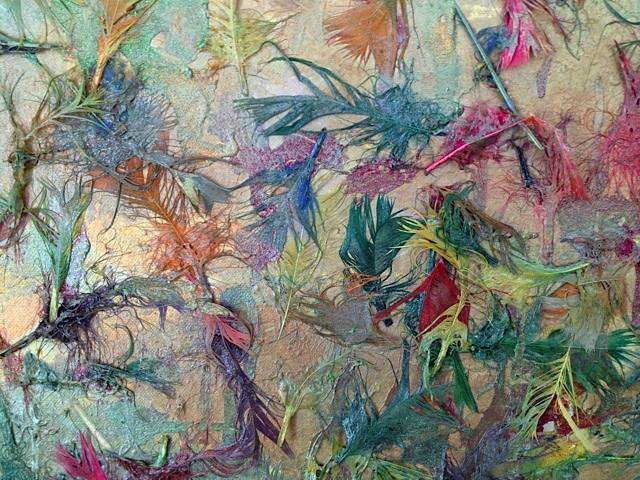 Nature oriented art often includes branches as line. 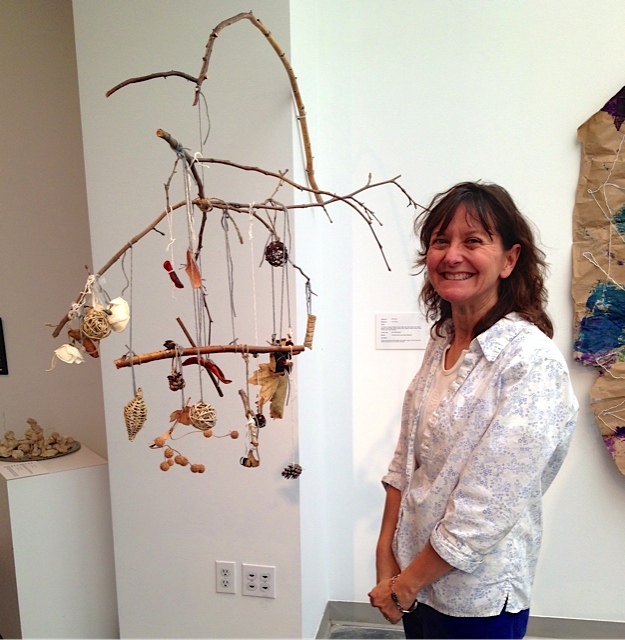 Here Master Teacher Kathy Walker shows off one of her student’s nature mobiles. 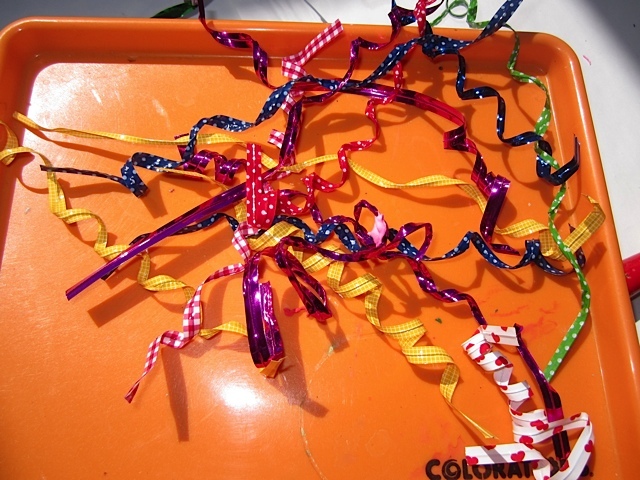 Pipe cleaners are bendable lines that can be combined with other materials in 3-D art. 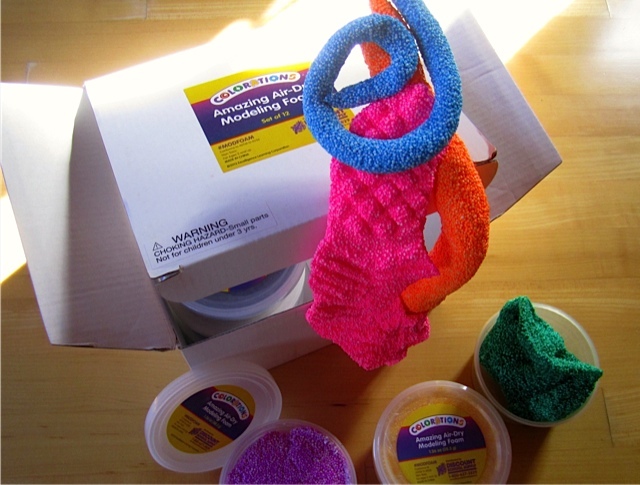 Not to be missed are the new (and fabulously inexpensive) Twisty Ties, or Twist and Bend Craft Ties Super Pack (TWISTY). They are shown here wrapped around paintbrush handles, and then combined with Colorations® Super Lightweight Air Dry Putty (CPUTTY). 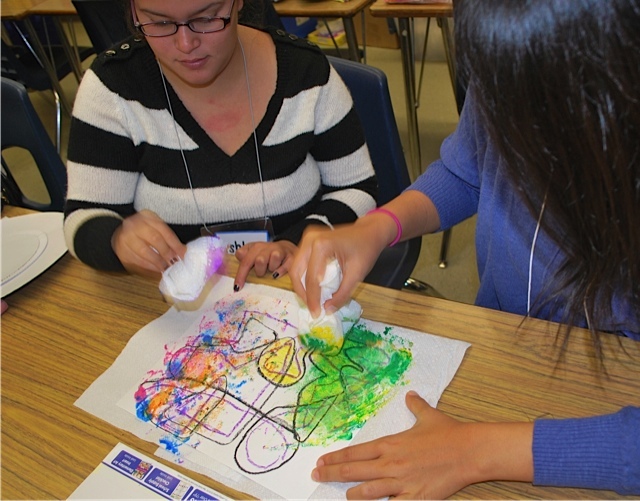 Last but not least, don’t forget the art of scribbling, which we did at the BAEYC Conference (and many other conferences this year) – reminding us that scribbling with crayons is fun for children and adults alike. 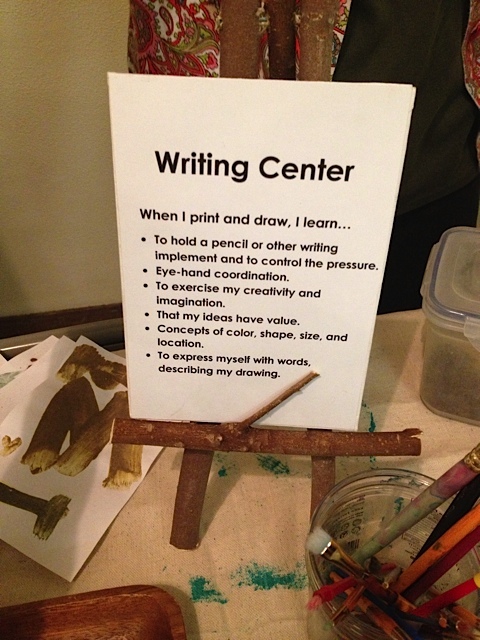 Written language and art…..it all begins with a line. 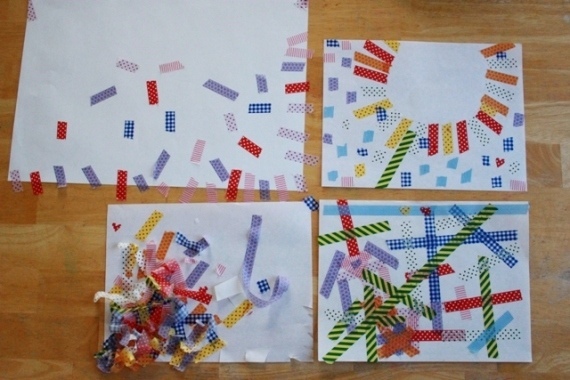 So go find new ways to look at lines and offer children a wide variety of materials to express themselves through line. I love to sing praises for Colorations® art materials, how can you NOT love a brand with that name? There’s always something new, sparkly or magical coming down the pike. So I say, who needs the high-priced brand, when Colorations® is less expensive and of better quality. Do you feel the same? When the new year rolls around, it’s fun to see what’s NEW in Colorations® art. Have you taken time to experiment with something new lately? If not, why not try something NEW each time you re-stock. If you “change up” your list of art supplies and new things here and there, you’ll help S-T-R-E-T-C-H young minds and imaginations. It’s true! Creativity thrives on new input, and new materials provide unique challenges and discoveries. 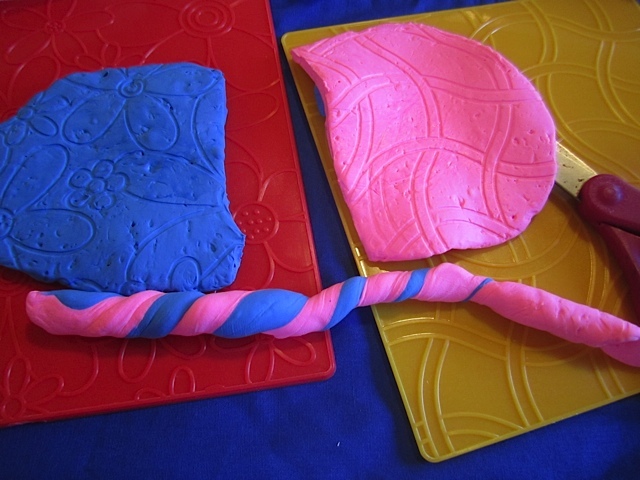 This weekend I experimented with three Colorations® dough products to compare and contrast their properties. It felt like a science experiment as I immersed myself in exploration and documented my results. The colors are bright and inviting. The small air-tight containers are practical and re-usable. The price is right at $14.99 for a set of 12 colors. After digging in, I realized immediately that it’s way denser than other manipulatives. 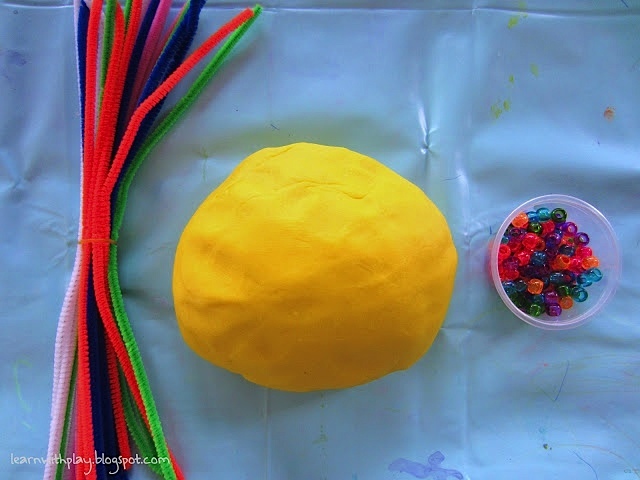 It offers a completely different tactile experience than play dough or homemade putties. Children will enjoy the simple process of rolling and pounding it. 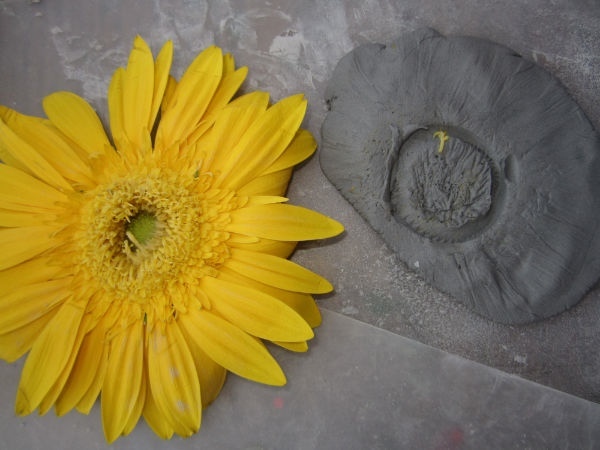 You can use it with the same clay tools you have on hand. I took the green and made a simple pinch-pot to test the material’s stretch-ability. 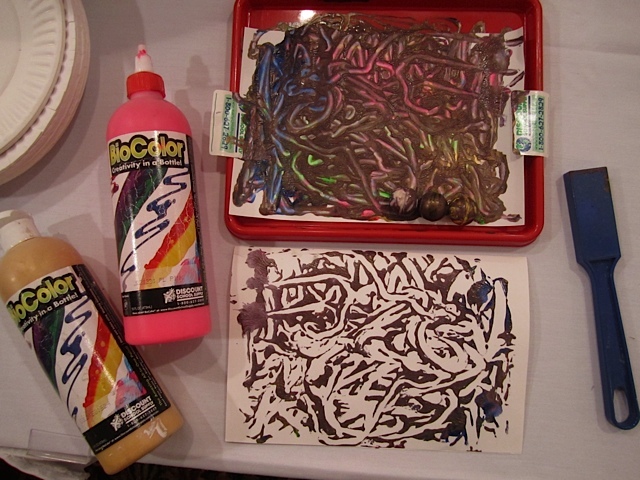 It’s pretty amazing – unlike any art material I had ever played with. 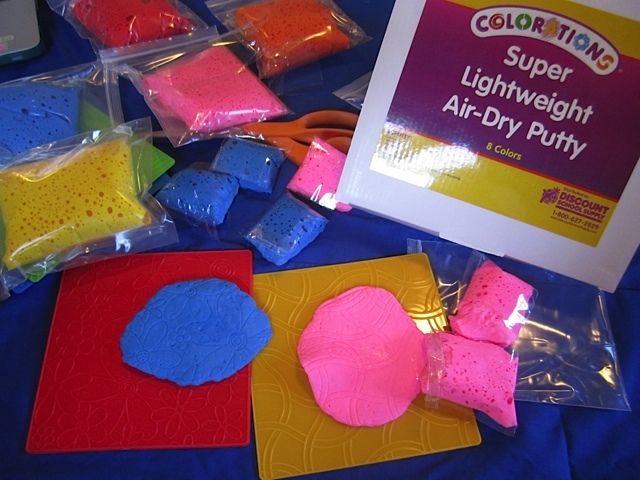 On a therapeutic note: Because Colorations® Amazing Air-Dry Modeling Foam is dense, it would serve as a great tool for helping children channel stress and calm themselves down if they’re feeling angry or fidgety. In other words, modeling foam will provide a physical release for tension much like the resistant putties that occupational therapists use. 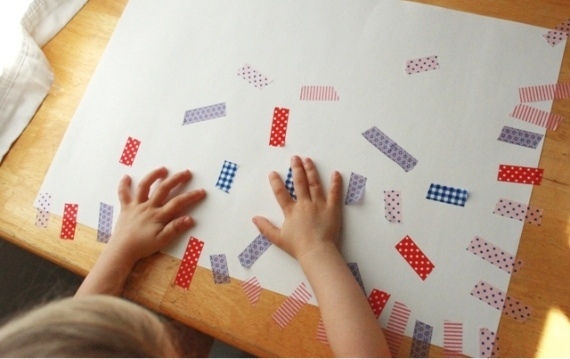 It will also help develop muscle strength in hands and fingers, which is excellent preparation for early handwriting skills. Look at how the dense quality allows it to stand up tall and keep its shape. Here I rolled out the blue, took a potato press to the pink, and simply squeezed the orange in my fingers. They held together when I pressed them, but if I was going to keep this I would add a little white glue to hold it together. If I didn’t want to keep it, I would put it back in the plastic air-tight containers, for re-use another day. As first this product looks a lot like Colorations® IncredibleFoam® Dough, but it has a much finer grain, so it holds a shape more easily. 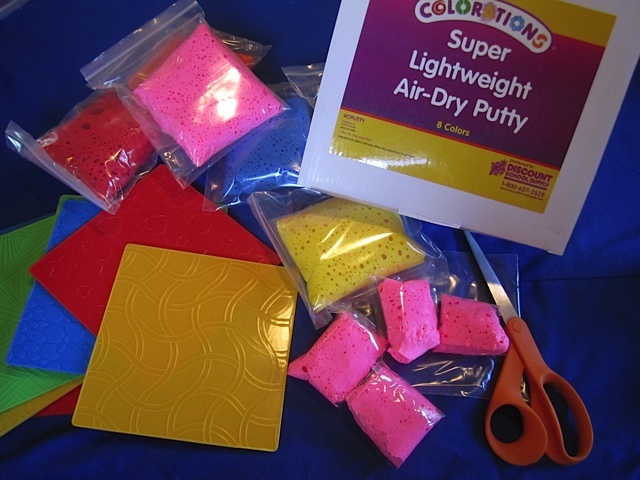 It also dries hard and is perfect for 3-D art (required by Ecers, remember?). 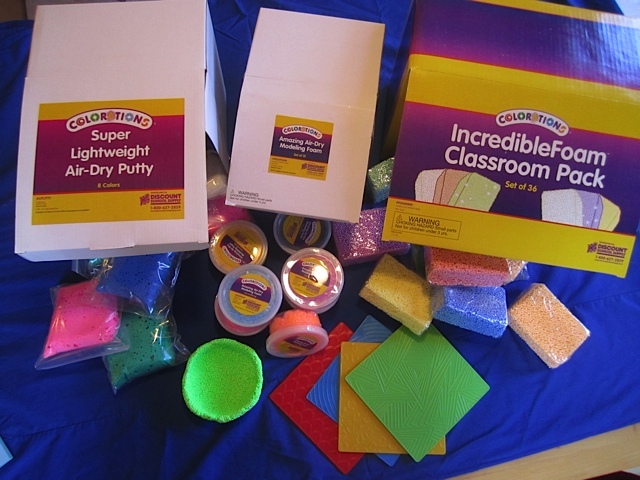 I look forward to seeing children use it in large recycled 3-D art, by molding and gluing it onto cardboard boxes, wooden blocks, plastic bottles and other recyclables. 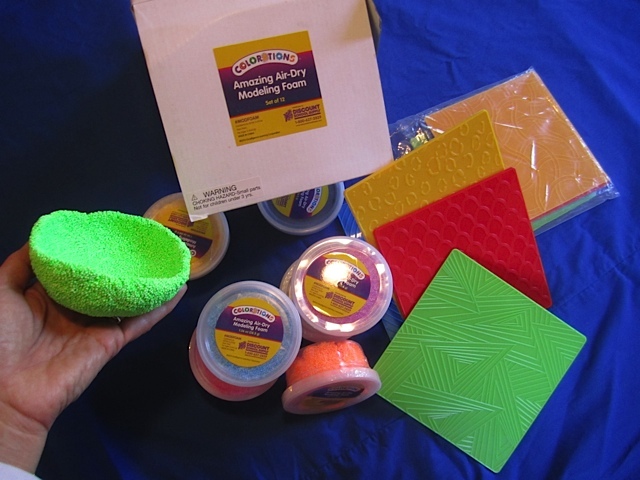 Here you see how another green bowl made from Colorations® IncredibleFoam® Dough compares. IncredibleFoam® has much larger grains, so it makes a rougher bowl shape. 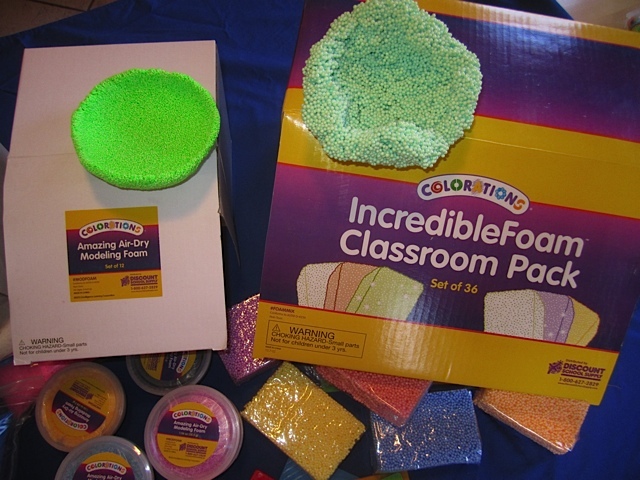 While the Air-Dry Modeling Foam dries overnight, the IncredibleFoam® never dries. 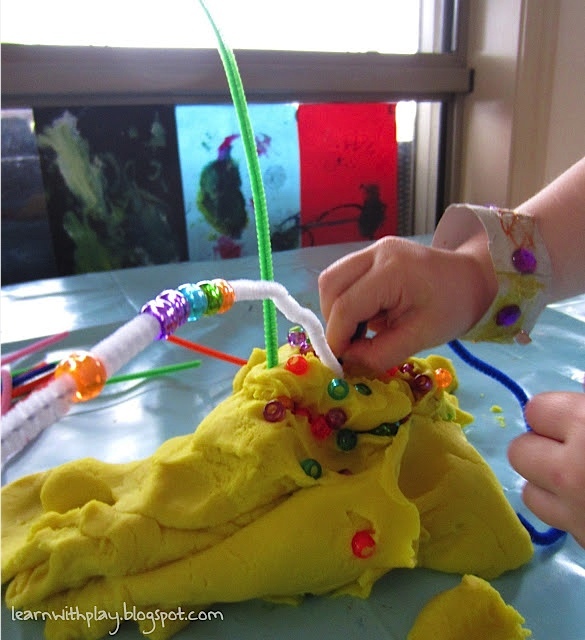 Both art products are fun to play with and can be completely child-directed. 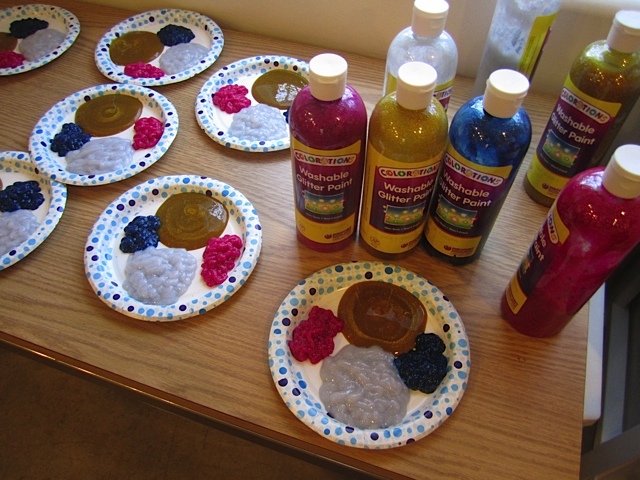 My favorite Colorations® dough is Colorations® Super Lightweight Air-Dry Putty. I love the white version since you can paint white air-dry putty with any water-based paint or marker, and therefore personalize it completely. But lately I’ve been working with the colored version of air-dry putty, which works beautifully with the new dough pattern plates. In fact, pattern plates and air-dry putty were born to go together. 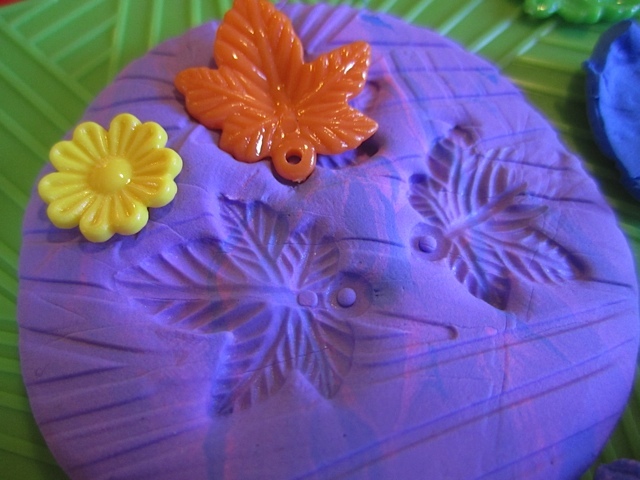 Air-dry putty is extremely fine-grained, so it picks up incredible details when imprinted with clay tools or pressed onto these patterned dough plates. 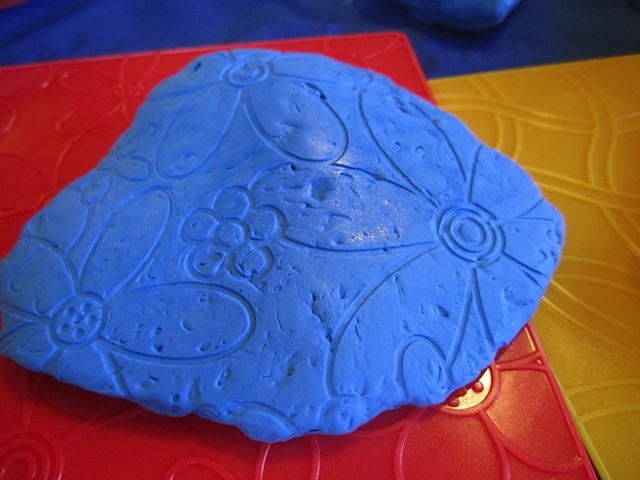 These pattern plates will make all your play dough and clay experiments more fun, too. 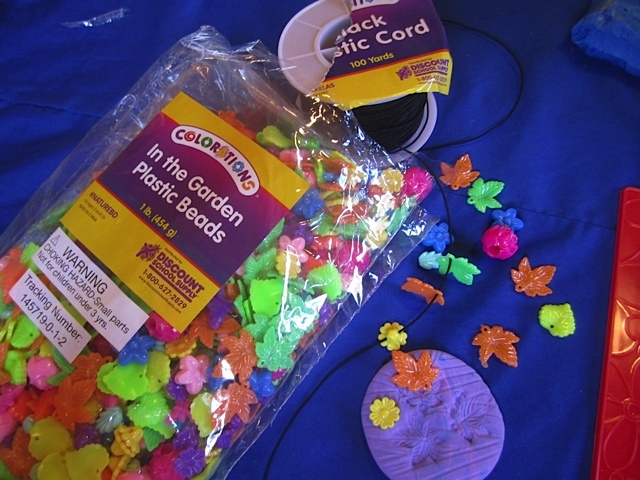 Next I brought out a pack of new In the Garden Plastic Beads. These brightly colored beads were much smaller than I expected, but they were full of delightful little colored leaves. 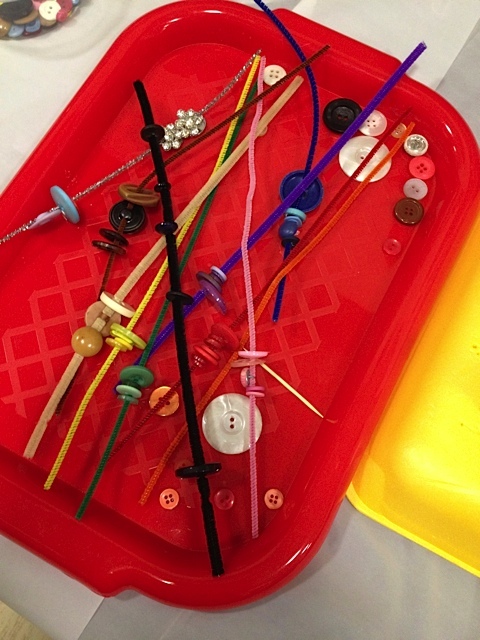 I was worried that no small child could string these beads because the holes are small, but they all fit perfectly onto Colorations® black elastic cord. 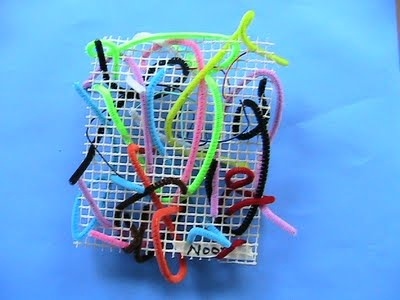 I think they’d be fine for four- and five-year-old children to string. 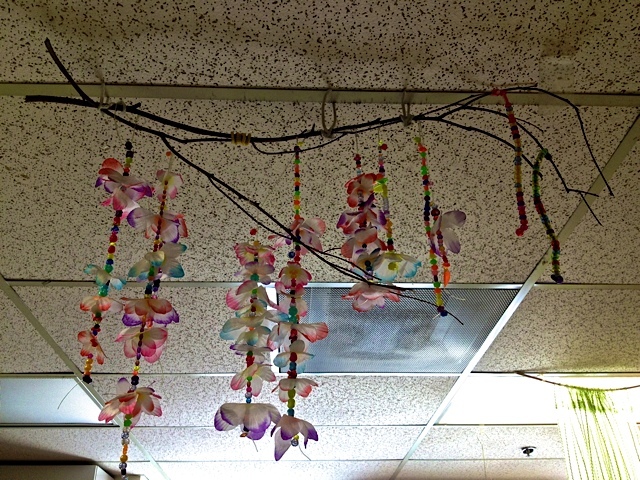 Plus they make great glue-down collage materials for the younger set and you get 800 beads in a pound, so this is a good budget-stretcher that ties in with nature themes. 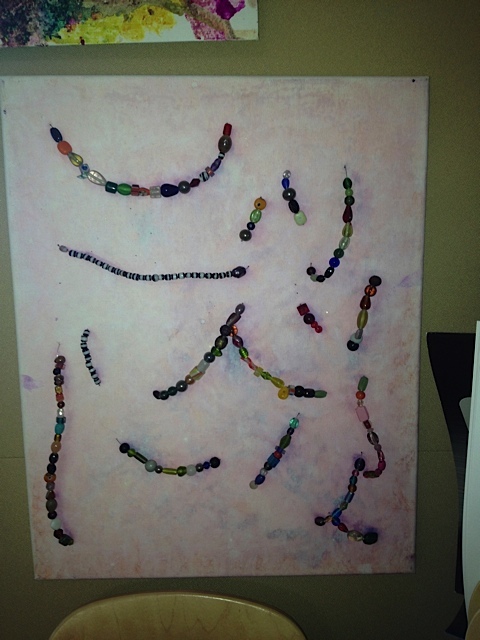 In the Garden Beads are very dimensional and make interesting stamped patterns on the air-dry putty. 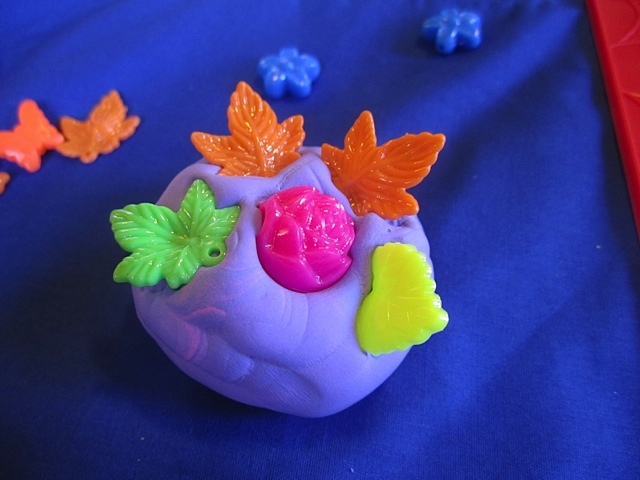 I used some of the leaf beads as stamps, and then adhered other leaf beads into the putty with a little glue. This is an excellent exercise in fine motor skill development, and the designs will motivate children who are visual thinkers. 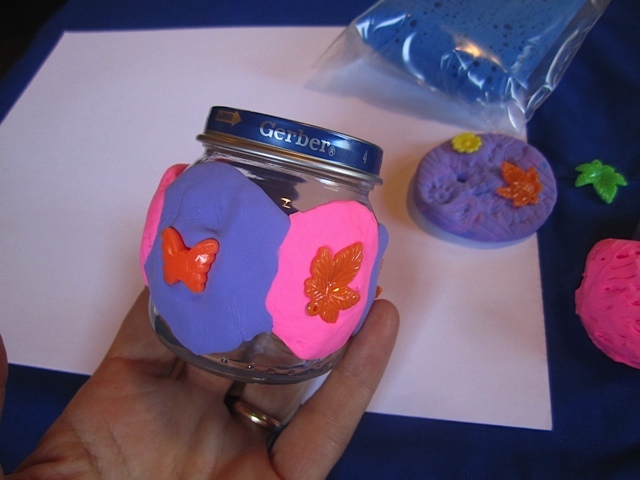 My mind kept going back to recycling, so I found a baby food jar and placed a large ball of putty on the lid as a decoration. Then I glued some more putty around the sides. I could have continued my discoveries, letting one idea flow into the next, but I was running out of time and the Super Bowl was about to begin. 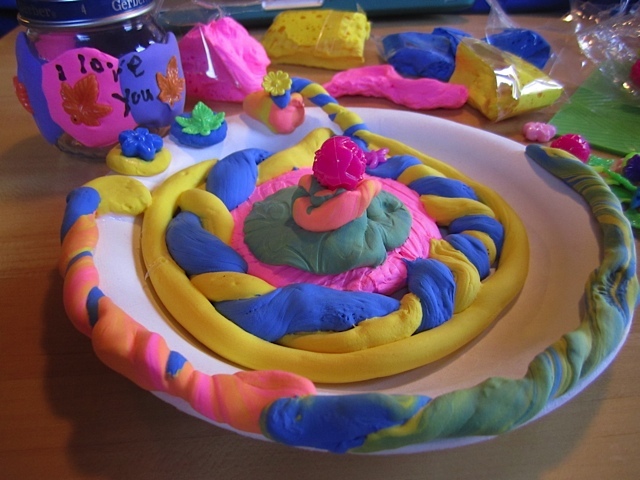 To finish off my experiments, I rolled out all the excess air-dry putty and created a simple Mandala with what I had on the table. 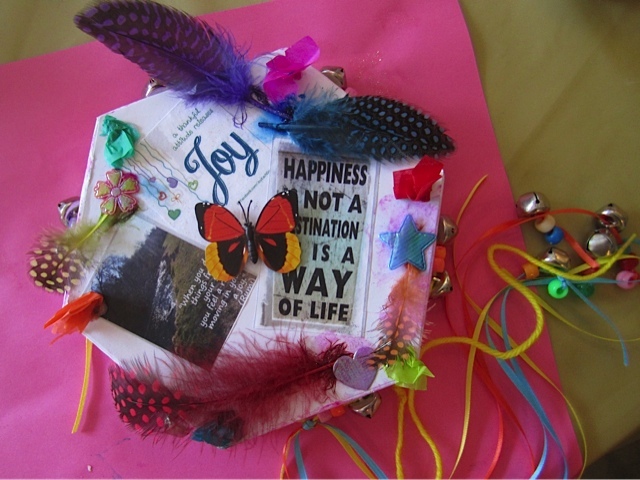 When in doubt with what to make, take a paper plate and create a mandala. There’s something about a circular design that’s always satisfying. Thanks for witnessing my discoveries, and please try some of your own soon. To celebrate Discount School Supply’s love affair with Colorations®, we are hosting a giveaway on our Facebook page! Beginning the week of February 10, you could win a Stamp Prize Pack, a Craft Prize Pack, a Finger Paint Prize Pack, a Paint Prize Pack or the Grand Prize of a Colorations® Ultimate Liquid Watercolor™ Paint Kit! Head over to our Facebook page to enter to win our drawing! The contest ends on Friday, February 14! What a handful modern life has become; it’s so easy to feel out of balance. 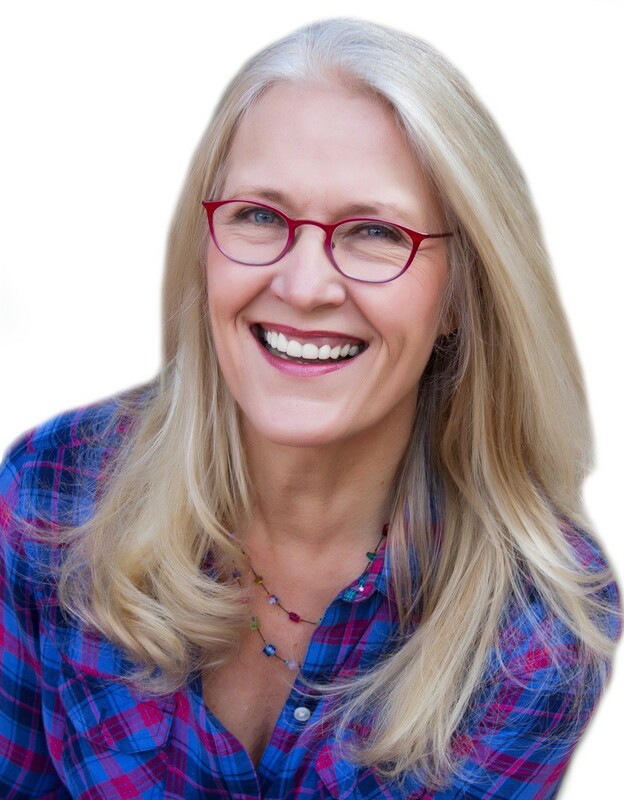 Taking care of our emotional health is more important than ever as the stress of every day living increases. 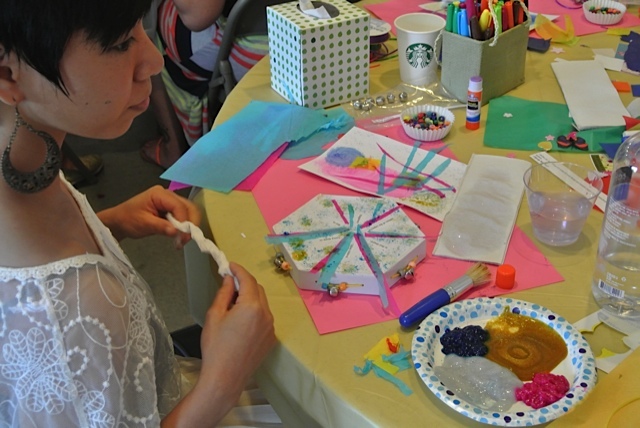 It’s a good time for adults to get together and enjoy the pleasure and renewal of creative pursuits. 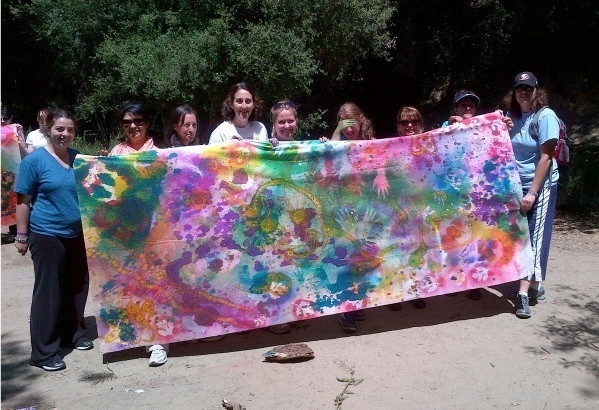 Collaborative art activities, like those presented here, are an engaging and affordable way to create community, have fun, and take active steps towards regaining the balance we all crave. 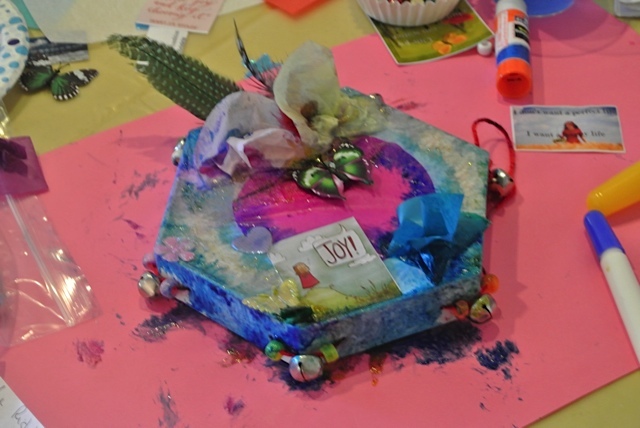 These photographs are from a colorful workshop held last month at “A Window Between Worlds,” a resource agency for domestic violence shelters. Every year I lead a workshop at AWBW for their “Train the Trainer” series. 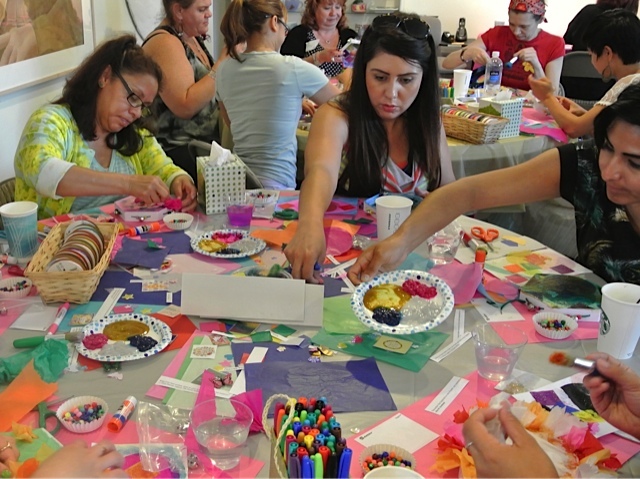 Those who attend are therapists and staff who run therapeutic art programs at battered women’s shelters throughout Southern California. Feedback on the training was very positive and I hope you enjoy these delightful photos. Working with AWBW’s program directors, we focused the training on self-renewal. 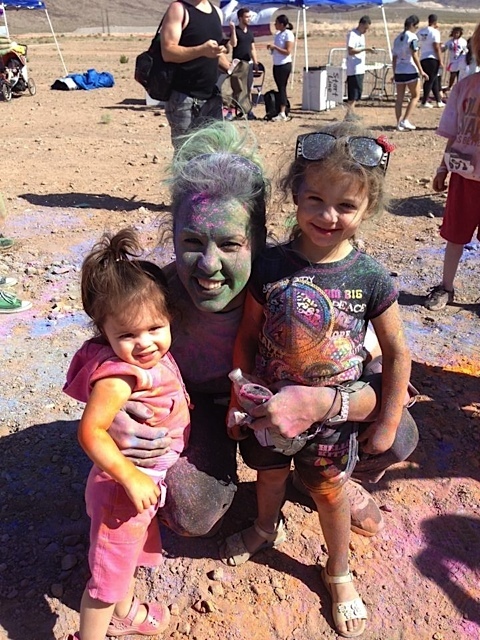 Our idea was to create a safe, nurturing environment and encourage participants to re-connect to their own happiness and experience a real sense of joy. To achieve this goal, the art supplies had to be colorful, inviting and abundant. I wrote a lesson plan based on our papier mâché tambourines and some of my favorite collage materials. 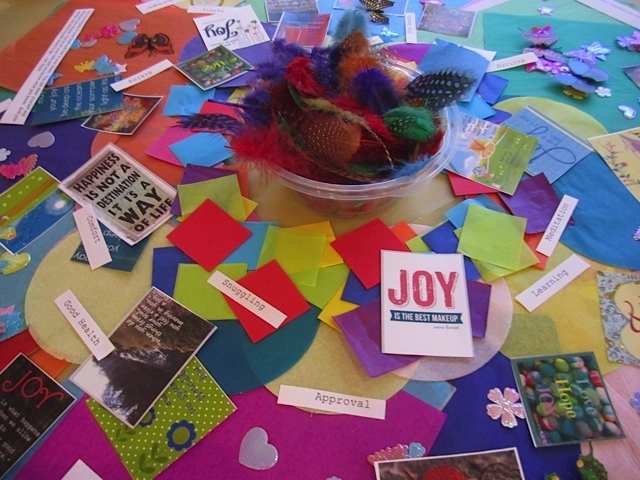 We called the lesson plan “Creating Joy,” and I recommend you try it for staff development (download here). 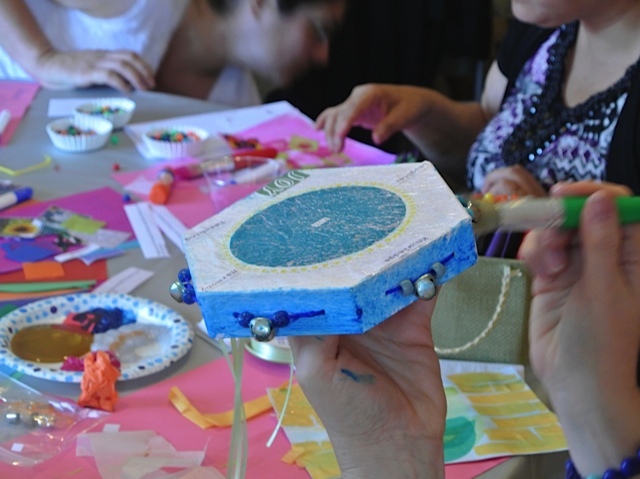 The results were beautiful, the participants had loads of fun, and the process was both relaxing and energizing (one of the paradoxes of art-making). My favorite part in preparing the lesson was finding “clip art quotes” to use as focal points. I found these color quotes on Sherri Bishop’s website. (download here) and also revamped my Values Clarification Worksheet. (download here). Feel free to use them both for this and other paper crafts. Remember, art and language go hand in hand. 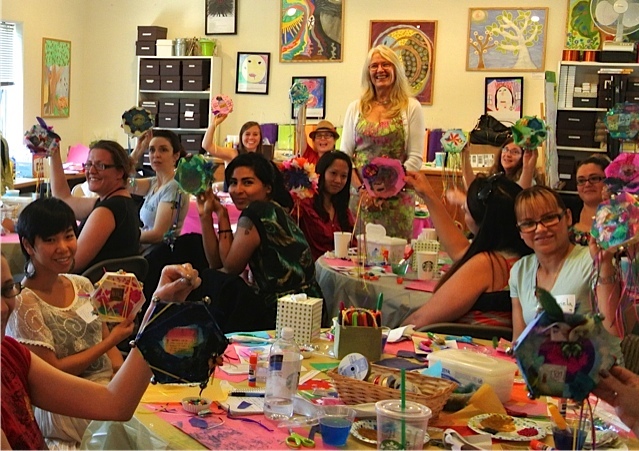 Adults relax and unwind with open-ended art activities when the instructor presents easy, success oriented art techniques. 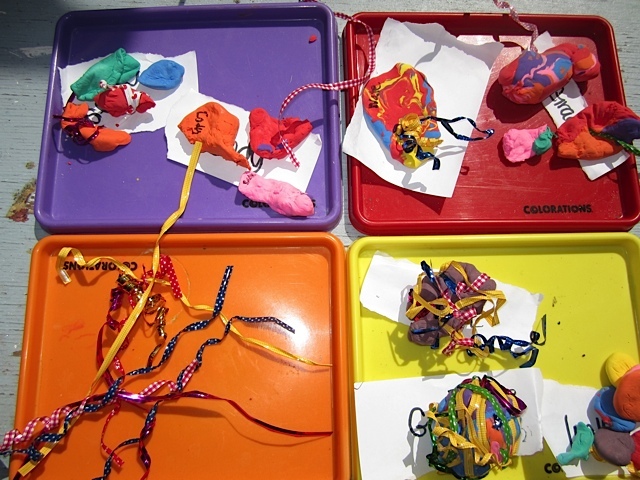 I hope you have someone on staff that truly enjoys leading art activities, and that you’ll try some ideas like these with your own staff soon. Want to know more about A Window Between Worlds? The AWBW Program is available to any agency or organization seeking to implement art as healing tool for survivors of domestic violence. 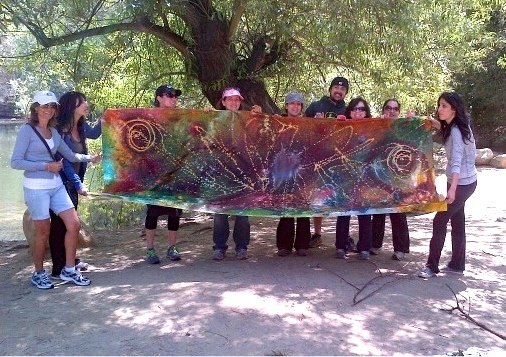 For further information on AWBW, please call (310) 396-0317, e-mail info@awbw.org, or visit www.awbw.org. 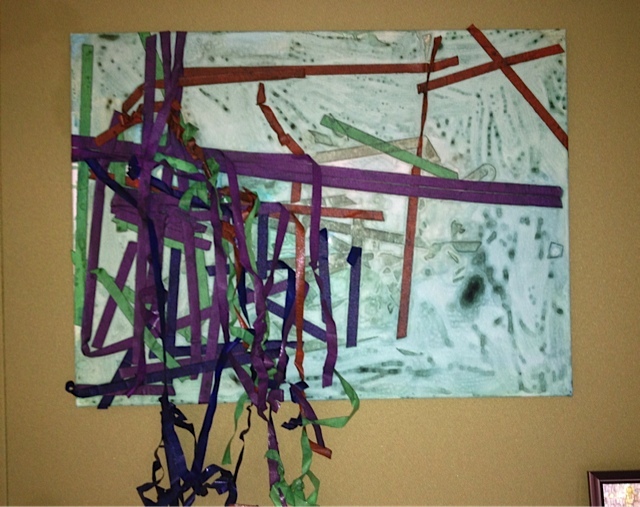 “Mommy, my art is in the trash!” said 4-year-old Noah with shock and dismay. This is how Board Supervisor, Janice Rutherford, opened her keynote speech to a large group of educators. 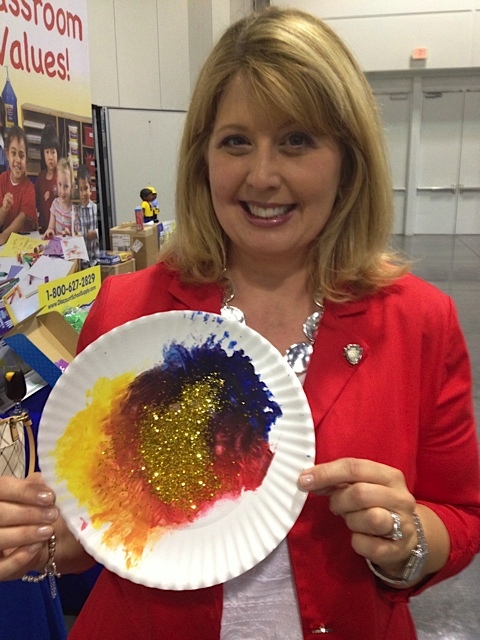 She held up her son’s paper plate painting, and told us how distressed he was when he found it in the trash can at home. How could this have happened? Surely it must be a mistake because who would throw away original artwork? 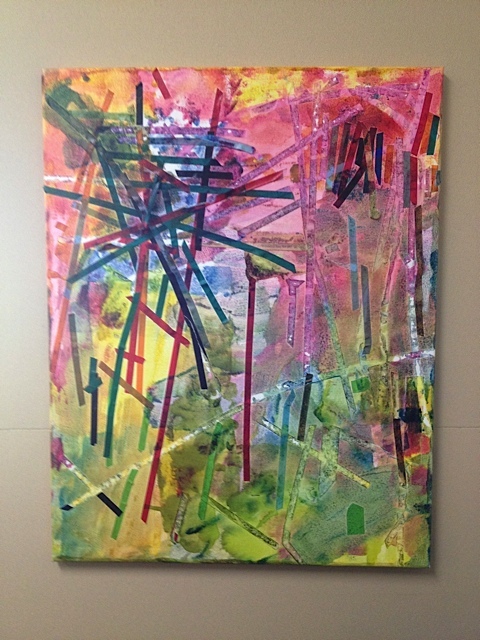 In my next post, I’ll be highlighting “Art in the Foyer” and show you inspiring examples of children’s art in school foyers and classrooms. 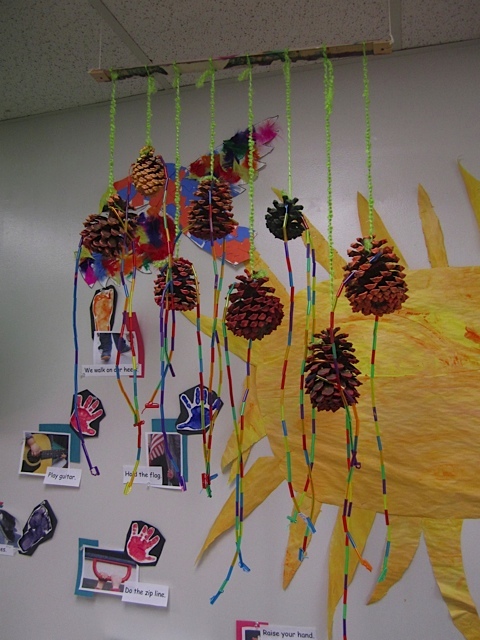 There are many temporary displays of process art experiences that enhance your classroom walls, but permanent or semi-permanent displays also add to your school aesthetics and make a statement about how you value creativity. 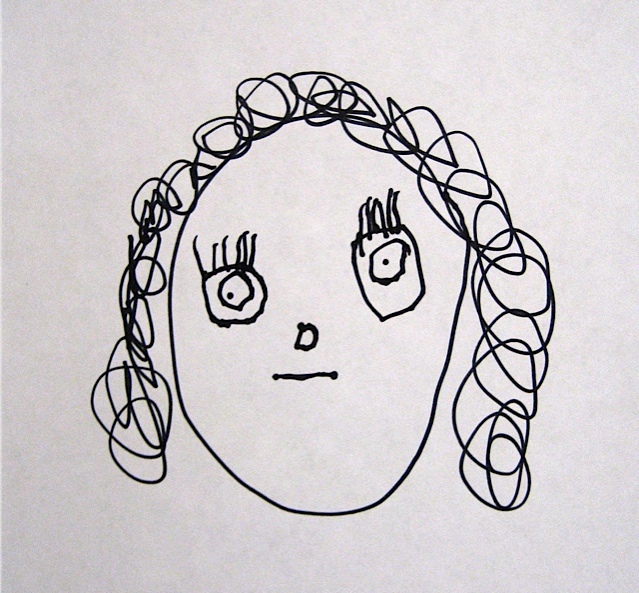 In fact, without much cost at all you can turn your entire school into an Art Gallery full of children’s work. 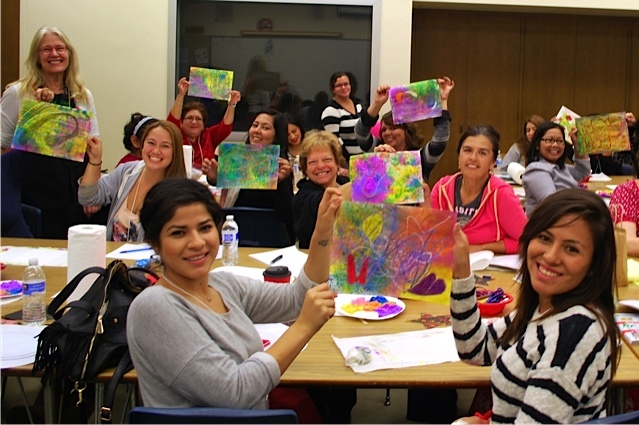 Here are a few creative ideas from Pierce College’s Child Development Center where Director Phyllis Schneider hosts a monthly forum and idea exchange for local Preschool Directors. 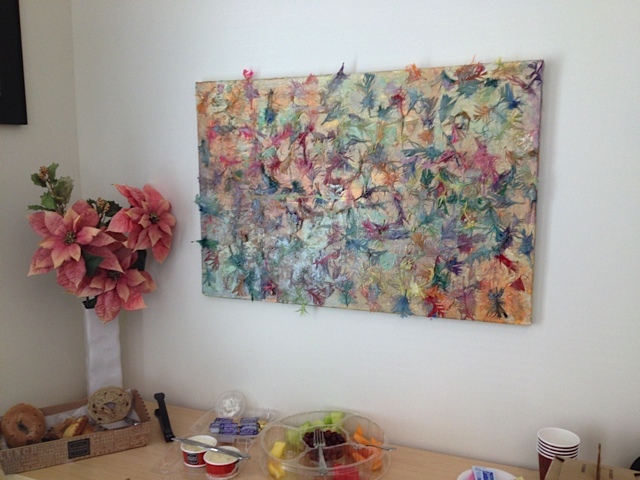 This abstract feather painting hangs in their meeting room and was easy for children to create with feathers and Colorations® Metallic Activity paints on a large donated canvas. Phyllis gave me a tour and introduced me to their art specialist, a lead teacher named Miyuki. 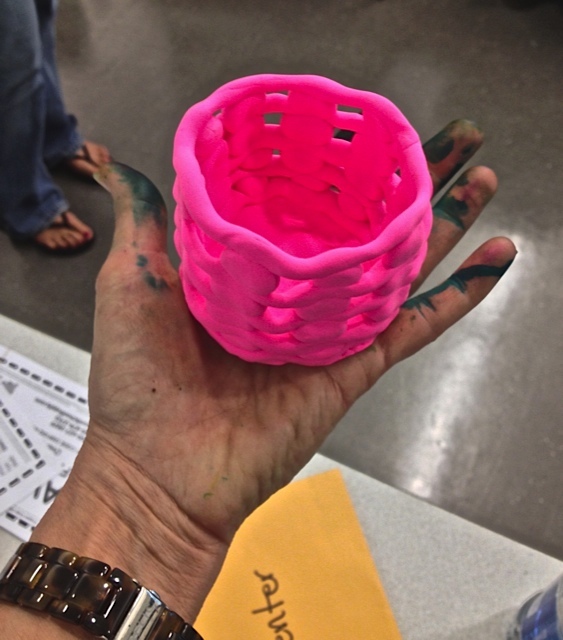 Sometimes it only takes one art oriented teacher to make a big difference in your entire school. Hopefully you have one of those, like Miyuki, and will encourage her to spread her mark throughout your school. Check out some of these inspiring abstract painting examples, which I will talk about more in future posts.